Is Hypnosis safe? - Yes, extremely safe, when carried out by a trained, insured and experienced professional such as Harrizon, or his comedy partner Dr. Jonathan Royle. What does a hypnotic trance feel like? - Many subjects report different experiences, but essentially a trance state is an extremely relaxing, enjoyable experience for everyone; allowing you to enter a world of fantasy through your own sub-concious in a way that feels right for you. Imagine your happiest daydreams that are 100 times more intense, and carefully guided by a master of the mind, and you won't be far off the mark. Can a hypnotist really make me run around like a chicken? 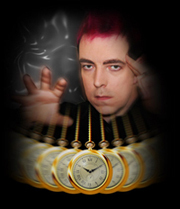 - Whilst many hypnotists laugh at the age-old cliche of subjects acting like chickens, it can be done... if you want it! Almost any suggestion that is within the subjects' own limits of morals and values can be achieved - the less morals and values you have, the further the suggestions can take you! How long does a show last? - This can depend on a number of factors, mainly determined by the client's needs, however the full show usually lasts for 1 1/2 hours plus an interval of 15-20 minutes. 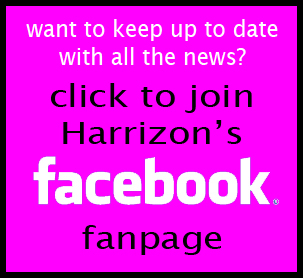 Which venues are suitable for Harrizon's shows? - Harrizon's act is extremely adaptable. As long as there is enough room for a performance area with a minimum of 6 chairs, and a little space in front for the volunteers to "do their stuff" you could be the host to Harrizon's show very soon! Whilst the show was originally aimed at the clientele of Gay Bars & Clubs, we are finding an increasing number of community and town centre pubs, along with Sports Bars and Working Men's Clubs etc, are looking to book the show. 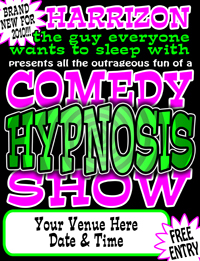 Depending on your requirements and guests Harrizon can tone down the campness of the act, and present a "straighter" show which is equally as funny. Can Children attend the show? - Harrizon's standard shows are quite outrageous, and some adult themes may take place, including sexual references etc. Therefore care is advised if considering bringing younger children to a show. However Harrizon has performed at Charity Events where children as young as 5 years old were present, and kept the show squeaky clean. If you are booking Harrizon for your venue or party, and you know that there will be children present, please advise Harrizon in advance. Is Harrizon really gay? - You bet he is darling! Harrizon lives with his husband and a little kitten called Campari... or is he? There have been rumours that he is really straight, and has a wife and 2 children. Does it really matter? Why the unusual spelling of his name? - "It's Harrizon with a Z, not Harrison with an S, 'cos Harrison with an S is Common!" Yes, you've guessed it, the use of a Z is partially in tribute to one of Harrizon's favourite idols - Liza Minnelli! Tell me a little about Harrizon's other hobbies and interests? - He can be found on his rare nights off, dancing the night away at some of the UK's greatest gay night clubs. During the day he is a keen bell ringer and gardener. Harrison also drives a bright pink Ford Mondeo with blacked out windows. Does Harrizon have the ability to cure phobias / help me stop smoking / lose weight / gain confidence etc? - During his spare time, Harrizon runs a very successful hypnotherapy clinic which whilst specialising in treatment for the LGBT community, has become increasingly popular with straight women who may not feel as comfortable with a straight male therapist. If you would like to improve your life, please contact Harrizon for more details.